Apple currently has more iPhone users in the United States than at any point in history, according to market research firm comScore. There are now over an estimated 85.8 million iPhone owners aged 13 and older in the United States, based on a three-month average ending December 2016, according to comScore MobiLens Plus. Apple's latest iPhone 7 and iPhone 7 Plus models accounted for approximately 15 percent of that total. 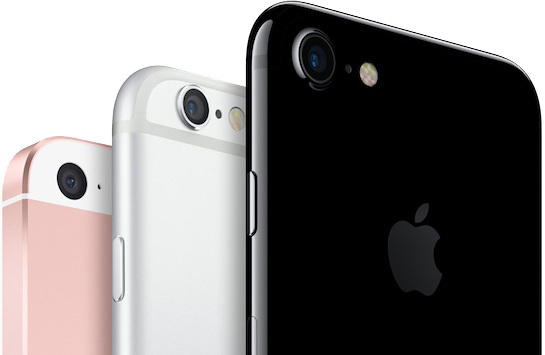 iPhone 6 and iPhone 6s models, including their respective Plus-sized versions, remain Apple's most popular smartphones in the U.S. with an estimated 48.4 percent share of the overall installed base. Meanwhile, an estimated 17.8 percent of the users are still using an iPhone 5, iPhone 5s, or iPhone 5c. iPhone is the most popular smartphone in both the United States and the world, according to market research firms Kantar Worldpanel and IHS Markit respectively. iOS adoption trails Android in the United States, however, given a wider variety of Android smartphones available to purchase. 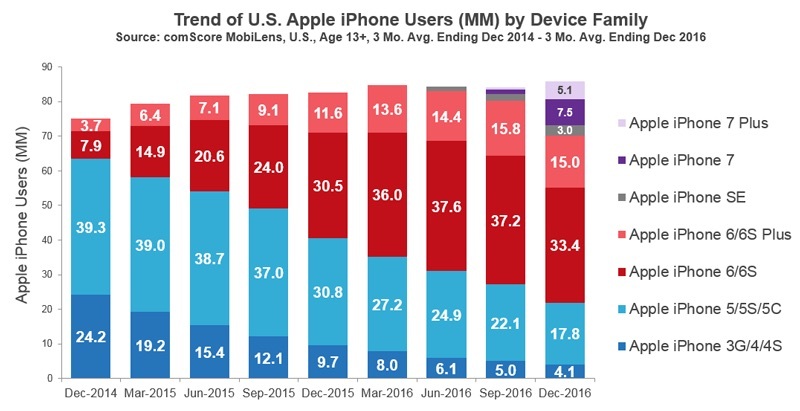 iOS adoption among smartphone users aged 13 and older is an estimated 43 percent in the United States, based on a three-month average ending December 2016, according to comScore. The research firm places Android at 54 percent during the same time period, with BlackBerry and Windows 10 Mobile barely registering. comScore's data differs from Consumer Intelligence Research Partners, which estimated that the iPhone's installed base reached 132 million units in the United States as of December 2016. However, CIRP's data is extrapolated from a survey of 500 Apple customers with no 13-and-over age parameter. After owning numerous android phones, my opinion is the iPhone is still the best smartphone around. The best software and best hardware longevity are hard to beat. I think their last few models have been fantastic. Not shocking they keep gaining market share. Good job Apple. It shows in spite of the naysaying you have identified your customers and they are satisfied. I have a 7+ and love it. Previously a 6S. My upgrade criteria is always: I want a better camera. Slowly but surely, my contacts are all switching from green text message bubbles to blue iMessage ones. It actually means there are more people in the US willing to spend huge amounts of money on a smartphone than any other country in the world. Looking at the chart, compared to Android, Android has increased MORE than iOS in the past 3 years. 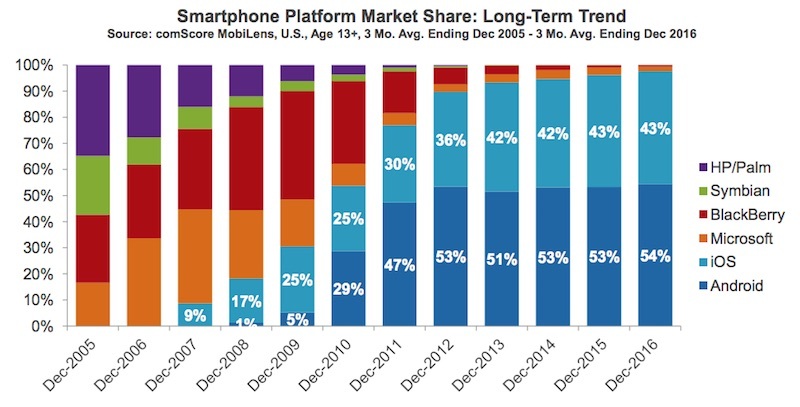 iOS is more or less stagnant. You mean, Stagnant in the sense how stable iOS is without having bloatware incorporated and The fluidity with very little lag/stutter using the interface . Or stagnant with a strong sense of security embedded to protect consumer data. iOS works well and does not necessarily have to be dynamic to perform beyond. Nice attempt at "Stagnant." Well deserved. Tim Cook keeps on making users and shareholders happy. I remember walking around the city with my iPhone 4 back in the day, as there was a rarity to owning one & it used to be a big deal. Literally almost everyone I know owns an iPhone in some shape or form today. Why would they be kidding? Apple's marketshare and sales continue to rise. These customers all have convinced themselves they need new phones every 1-2 years. I don't see them running en mass to any competing brands. And I don't see any competing brands that offer the consistency in build and features that iPhone continues to do. This is a bit misleading guys. The majority of these iphones in the USA are 3+ years old. That's not a graph apple is proud of. Why they should push another iOS update to slow our phones down more to force us iPhone 4, 5, & 6 users to upgrade. So now because they support older phones and iPhones last longer than Android phones, Apple shouldn't be proud and should be blamed? It might not be the best news for Apple's sales dept. but there's a clear goal and mandate to sell out of the newest phone every year which they always do. Do they really need a monopoly position to make you happy?